The world of commercial imperatives and ignorant expediency that is the governance of International cricket will be sighing in relief at the passing of Bill Frindall – the last and best defender of the integrity of cricket’s records. Unlike the unspeakable apparatchicks of the International Cricket Council (ICC) Frindall was determined that the well-established principles that governed the designation and status of matches, especially international matches, be rigorously applied. So when the ICC created the so-called “ICC Super Series” in October 2005, an event which comprised one six-day match and three fifty over matches between Australia and an “ICC World XI”, Frindall was in the forefront of the campaign to deny these matches official “One Day International” (ODI) and “Test Match” status. The ICC had decided that the commercial prospects of the “ICC Super Series” would be enhanced if the matches were given the same status as official contests between countries and that performances in them would count in the Test and ODI records of the players who took part. This “decision” flew in the face of precedent and logic – Frindall called it “witless” and argued, irrefutably one would have thought, that the international records should only cover “contests between nations”. Bill declared that the six day match, a game which he said was “bordering on the farcical”, would not be included “…in any international records that I compile”. The Playfair Cricket Annual, of which Bill was the long serving editor, strictly applied this rule but sadly other cricket records such as those of Wisden and Cricinfo have not followed Frindall’s lead. The best tribute that the world of cricket could pay to Bill Frindall would be to recognise that on the matter of the status of the failed hoopla of matches in the “ICC Super Series” Bill was one hundred percent right. Cricket’s international records should now officially be revised to exclude these matches - the Bearded Wonder would smile forever in eternity if common-sense prevails in this way! It was an inspiring and moving experience to be present at both of the Carling Cup semi-final matches between Burnley and Tottenham Hotspur and whilst as a Spurs supporter I was of course pleased that Tottenham scraped through, triumph is the last of the emotions I feel. This was football at its best and, in many ways, football as it used to be. Whilst the prima donnas of the top clubs in the Premiership fill the tabloid columns and the shenanigans surrounding there ownership creates headlines on the financial as well as the sports pages Burnley v Spurs was all and only about football. It was as far removed from the grotesquery of Manchester City’s owners trying to buy Kaka and success as it is possible to get. The core attraction of football, the quality that gave rise to the perhaps overused descriptor "The Beautiful Game", is its simplicity and the way that this allows spectators instantly to relate to the action. We saw two five goal matches at White Hart Lane and at Turf Moor – ten goals in 210 minutes of pulsating football. The goals, one every twenty minutes or so, were the just rewards for effort and ambition – especially so in Burnley’s case. Football, above all cup football, can be a great leveller and no more so than in this clash in which one team, Spurs, had many players who individually earn more than the total staffing costs of the Burnley squad. I use “earn” with a slight sense of irony because although there was no lack of effort from Tottenham on the two nights few of the players really justified their big transfer fees or their mega earnings. With far lesser resources at his disposal Owen Coyle has created a team that completely outplayed Harry Redknapp’s bunch of stars for much of both games. At the Lane Burnley were by far the better side in the first half and deserved their one goal interval lead – it should have been more. Then in a twenty minute spell in the second half Spurs played their best football of the season to score four goals and seemingly put the tie out of Burnley’s reach. But from the start at Turf Moor there was no feeling of doom, gloom or resignation on the part of the Burnley faithful – nor, crucially, among the players either. There is a symbiosis here which Alastair Campbell (yes that Alastair Campbell) referred to prophetically in the programme: “Winning 3-0 against a Premiership side of course won’t be easy. But if the players don’t believe it nobody can. And if the players do believe it, then so can we”. Well win 3-0 is exactly what Burnley then did – over 90 minutes. And had this been a European two-leg tie rather than the Carling Cup that would have been it – Burnley would have been on their way to Wembley. But quirkily the rules of this competition meant that they had to play another thirty minutes without conceding a goal – and that was just beyond them and Spurs escaped with the latest of strikes from Pavlyuchenko and Defoe. If you are a seeker-after of justice then don’t be a sports fan – that’s not always how it works. The Burnley team and their superb supporters certainly deserved to go to Wembley not just for their efforts and their style but also for their skill and bloody-minded determination not to give up – and for their belief. They have two more chances this season in the FA Cup and possibly in the play-offs from the Championship. I won’t be the only Spurs supporter wishing them well. On March 1st whilst I’ll be hoping that the Tottenham All-Stars win the Carling Cup I will have a slight embarrassment that the Spurs are there at all and a memory of two semi-final encounters that transcended sport and restored my faith in human nature, if not in natural justice. Cometh the hour cometh the man and of England cricket could there be any doubt that the hour is nigh and that there is a desperate need for capable and moral leadership at the top? Under the malignant Chairmanship of Giles Clarke the England and Wales Cricket Board (ECB) has plumbed new depths – as the events of the past few months in respect of the England captaincy have shown beyond doubt. I use the timeframe “Months” not “Weeks” because it stretches back to the day in early August when Michael Vaughan and Paul Collingwood stood down as captains of the England Test and One Day sides respectively. To stand down in the middle of a series is not unprecedented but for men of Vaughan and Colly’s status and integrity to feel that they had no alternative but to fall on their swords says clearly that all was not right in the England set up. Where were the man-management skills in the England playing set up when we needed them? Surely if the relationship between Hugh Morris, Peter Moores, Vaughan and Collingwood had been as it should have been then any need for change in the captaincy would have been anticipated and handled in a less panicky way. Vaughan’s stress and disappointment was for all to see in his tearful press conference – he didn’t (quite) lose his dignity but there is no way that he should have felt obliged to walk the plank so publicly in the way that he did. The Test series was already lost – surely Vaughan could have been given support by the ECB hierarchy for one more Test match - and then any issues over the captaincy could have been dealt with in a calmer environment at the end of the series. And Collingwood was treated an a pretty cavalier way as well – he was clearly pushed, he didn’t jump, when the ECB decided that they wanted one captain in future and that he was not that man. Whilst Hugh Morris as Managing Director of England Cricket was the man with the monkey on his shoulder above him was the highly paid CEO of the ECB, David Collier and the controversial Chairman of the board Giles Clarke. What role did they play in the whole affair – and more recently what role have they all played in the extraordinary events of the past couple of weeks with Kevin Pietersen? Elitism. He referred to those with no access to satellite TV as "less fortunate members of society” and sold us down the river to Sky. Ignorance. He is a businessman, with no real knowledge of the game, which led to the vulgarity of Stanford, and the continued confusions on Twenty20. Complacency. Whilst Clarke is blusteringly bullish on frivolities like Stanford (etc.) he has failed completely to get to the heart of English cricket’s problems with reform of the unsustainable county structure. There has to be someone of substance out there to challenge this man or he will be re-elected unopposed for a second term. Mike Brearley, since retiring from the First Class game in 1983 has concentred on his second career as a psychotherapist and he has until recently never held an executive role in the game. He has, however, written wisely and often both as a journalist and, particularly, in his seminal book “The Art of Captaincy”. His knowledge and track record as a leading thinker on cricket is not in doubt. Nor is his moral integrity and courage – as he showed, in particular, back in 1968/9 over the D’Oliveira affair. Brearley was the previous President of the Marylebone Cricket Club – a role he performed with distinction showing that he love for the game and his understanding of what matters on and off the field are undiminished. 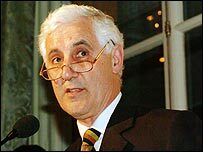 Mike Brearley would make an honourable, skilful and respected chairman of the ECB and I have little doubt that if he stood against Giles Clarke he would be elected by the 18 counties (plus the MCC) who vote on the appointment. If ever there was a time when there was a need to restore harmony in English cricket and have the game driven with somebody who has other criteria of judgment than just the commercial/financial it is now. Cometh the hour cometh the man indeed! In those increasingly distant days when I was corporate man (sort of) management training courses often liked to characterise management style in shorthand. One of the theories, which I always rather liked, was the idea that as individuals we can all be seen as being more or less task oriented and more or less process oriented. In general an extreme propensity to focus pragmatically on the task in hand is unlikely to be compatible with an individual also having a strong emphasis on ensuring that the correct processes are followed – and vice versa. It’s not quite as black and white as that, but as a quick description of different styles it is quite handy. Organisations need both types and ideally amongst their more senior people they need those with a blend of task and process orientation. In reality the head honchos in any hierarchy are far more likely to be process focused whilst the more junior staff are more likely to be effective if they concentrate on the task in hand. But at all levels in the hierarchy you will find those who will cut corners and bend the rules in order to achieve an immediate goal – and also those who will be anxious to stick rigorously with the process - and sometimes miss opportunities as a result. Steve Waugh and Mike Brearley were both great captains – albeit that they have very different personal styles. But neither was an instant success. Although they had both led other teams before becoming an international captain the demands of the bigger job are such that in a way nothing really prepares you for it. And when Kevin Pietersen took over from Michael Vaughan just before the Oval Test against South Africa match in August 2008 he was even less prepared – his captaincy experience was virtually nil. Chutzpah and adrenalin carried KP to a fine win in his first Test match as captain and he followed this with a wonderful 4-0 win in the one-day series as well. Piece of cake. Except of course that it couldn’t last and the team fared less well in India – although there were not too many criticisms of KP’s captaincy, more of the failures of key players in the team like Bell and Panesar. But in his first matches as captain Pietersen can be seen to have done pretty well – not least when account is taken of the fact that the role had been thrown rather unexpectedly at him after Michael Vaughan’s sudden resignation. Now let’s return to the management theory about task and process leaders. KP looks like the archetypical task leader to me. This is not to say that he lacks a tactical cricket brain nor that he doesn’t have an “ultimate team vision” as Steve Waugh called it. But Pietersen seems like the sort of man who really wants results and won’t let anyone stand in his way. More Shane Warne than Steve Waugh - although nobody would really call Waugh anything less than task focused! But Waugh probably wouldn’t have said about the role of the cricket coach that the “only coach a cricket team needs is the one to transport them from their hotel to the ground” as Warney once famously remarked. And one suspects that Kevin Pietersen would strongly agree with his friend Shane – and that that has been the cause of the recent trouble in the England camp. KP and Peter Moores were two girls trying to share the same stove – and that never works! If Hugh Morris did make a call along the lines that I have suggested and KP chose to ignore such a reasonable plea then KP is culpable and deserved to have been sacked. But if the ECB apparatchiks fumbled and flustered when they saw what KP seemed to be up to in relation to Moores and if this led them to private denunciations of KP’s insolence and arrogance but not to a serious attempt to avoid disaster then it is the ECB officials who are seriously to blame. On TV yesterday both Nasser Hussain and Lord MacLaurin were critical of the behaviour of Kevin Pietersen. Hussain said "Definitely, Kevin Pietersen himself should have gone about this in a much more professional way. You can't just sit on safari in South Africa and issue ultimatums to the board about the England cricket captaincy," and MacLaurin said "It is a mess and it is very sad the captain was away in South Africa but as I understand it he put a pistol to the head of the ECB and said, 'Back me or sack me', and I think the ECB were absolutely right. The ideal solution would have been to put Peter Moores and Kevin Pietersen in a room and said, 'Sort out your differences'. Sadly they were unable to do that." We don’t yet know the full story. Whether the process management of the ECB failed - perhaps because it has been a holiday period and communication was difficult we don’t yet know. Whether KP was really as crass as suggested by Husain and MacLaurin we don’t know either. But if you accept the principle that you want your suits to manage all the processes well whilst you equip your captain and your team to win cricket matches then on the face of it it is the process managers who have completely failed in this instance. Unless it really is true that KP has acted with a total disregard to appropriate behaviour – in which case the suits shouldn’t have appointed him in the first place! As Nasser Husain also perceptively said "The ECB knew from his history what sort of guy (Pietersen) was. He was abrasive, he took people on, he asked questions of people. When he took over the captaincy, he was going to be in your face. They must have known that eventually it was going to come to a clash between Pietersen and Moores and they should have been able to react to that." The departure of Moores and KP must surely be the final nail in the coffin of the incompetent and malignant regime of Giles Clarke and David Collier at the ECB. It actually defies belief what damage these two have done to the good name of England cricket and if they had any decency they would go – NOW! The charge sheet against Clarke is long and shaming. It isn’t only the Stanford debacle that must be laid firmly at his door. Far from it. He has single-handedly ensured that by his complete failure to manage his staff, starting with the otiose Collier and including the selectors and above all the Coach that he couldn’t run the proverbial piss up in a Brewery. Whilst Clarke was gallivanting with Stanford and his tainted millions England cricket was sailing into very squally waters indeed. The finances of the ECB are huge, but under Clarke no serious effort has been made to correct the imbalance which exists between the money that is needed to create a credible cricket infrastructure in England, and the ridiculous handouts that sustain the untenable County system. In short Clarke wastes our money. The next charge is in respect of the media rights to England cricket. Surely the imperative has to be to ensure that the maximum number of TV viewers can see the game – not to maximise revenues. Clarke’s ignorant and abusive diatribes at the BBC were uncalled for and counter-productive. The BBC has walked away from covering England international cricket largely because Clarke, in his pursuit of riches from Sky, gave them no encouragement and his arguments otherwise are utterly disingenuous. It is the vulgarity of the man and all that he does that sticks in the gut. The departure of Michael Vaughan had all the hallmarks of an organisation riddled from the top with people who haven’t a clue about man management. The failure to create a hierarchy within which the Coach and the Captain worked harmoniously together is also a direct consequence of the Clarke/Collier axis’s incompetent management behaviour and style. 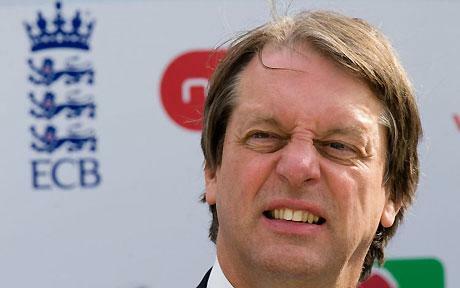 The enduring memory of Giles Clarke will be Stanford which reduced the game of cricket to a fairground attraction and did untold damage to the reputation of the game. It was the antithesis of the Spirit of Cricket. I’m very sad to see Pietersen go – rather less so to see the departure of Moores. But let’s put the monkey fairly on the right shoulder – stand up Giles Clarke and wave goodbye. Kp versus Moores - only one winner! The English cricket establishment finds it hard to cope with a Captain with cojones. Vaughan had them, but was quite a diplomat and had a strong ally in Duncan Fletcher. Pietersen runs on a supreme self-confidence which comes in no small part to never having been part of the flaccid and unambitious world of English cricket – especially English county cricket. KP used Nottinghamshire and Hampshire simply as necessary tools to realise his ambition to play international cricket. Once he achieved this he has never looked back. KP’s leading by example started in his very first Test match when he top-scored in each England innings at Lord’s in the first Ashes Test of 2005. He almost immediately became part of a triumvirate who were the real inspiration behind England’s Ashes triumph (Fletcher, Vaughan and KP). Of course other players played out of their skins in 2005 – but KP was absolutely key to the regaining of the Ashes as much from his attitude and style as from his contributions on the filed of play. Moores is a product of the English County system as player and coach. This system is moribund, outdated and complacent. It produces people like Moores – jobsworths with no real thirst for a fight and none of the get up and go we see from Australia and South Africa. KP, like Tony Greig before him, doesn’t think much of county cricket and doesn’t think much of the putrid English cricket establishment. He is a winner and he doesn’t want banal and pedestrian plonkers like Moores in the dressing room!